12:17 AM EST — And we’re finished. The Bobcats looked really good against Sacramento, controlling the tempo and pace basically from the jump, and winning it running away, 121-87. Michael Kidd-Gilchrist (18 points, 8 rebounds, 5 assists, 4 steals) and Jeffery Taylor (17 points, 3-4 on threes) both looked great, and Thomas Robinson had as many ups as he did downs (19 points, 5 rebounds and 8 turnovers). But the great thing about summer league is that there’s always tomorrow. My job today was to watch basketball and connect a bunch of words together that accurately conveyed what I was watching. I watched more consecutive games today than I’ve ever watched before, eight of them, one after another, back-to-back-to-back-to-back-to-back-to-back-to-back-to-back. Hopefully I was able to make that happen. Thanks for reading and tweeting along all morning, afternoon and night. Sure, summer league isn’t the highest level of basketball you’ll ever see. But the majority of these guys are playing for a job, playing really hard every moment they’re on the court, and that’s something you rarely see for every minute of an NBA game. I found pleasure in that, tried to replicate that effort, and I look forward to watching many more summer league games over the next week or so. Though probably not first thing tomorrow. I’m dunzo for now. And the winner is? My couch. My poor couch has literally supported me through thick and thin, and today was no different, as I planted myself here from 8 AM until midnight, a 16-hour basketball-a-palooza. Without my couch, none of this works. So thank you couch, for being so couchy. You are the couchiest. 11:02 PM EST — Just realized that this blog is actually sponsored by Red Bull. That’s, like, ironic or something. 10:56 PM EST — People have been emailing and g-chatting me all day today and asking me how I’m doing. Are you holding up? Can you make it though the day? Well, I think I’m going to survive. The Bobcats and Kings have nearly reached halftime of this, the eighth consecutive televised summer league game of the day, meaning we have but two quarters left to play. Charlotte jumped ahead to a 32-23 lead after one, and as I post this with four minutes to go in the second, Charlotte is leading 46-34. Kidd-Gilchrist scored 10 points in the first 7 minutes, killing the Kings in transition, zooming up the court over and over. He started 6 for 6, and even threw down a two-handed dunk over Sacto’s reserve center, Rob Kurz. Actually, the Bobcats have looked pretty good throughout the first half, though they’re so young that I think Kemba Walker might be their oldest starter. Bismack Biyombo is all muscle, and so strong he looks like he might burst out of his jersey. Another rook worth keeping an eye on is Jeffery Taylor, Charlotte’s first pick of round two out of Vandy, who looked to have a really nice midrange game. As for Thomas Robinson, I was pleasantly surprised by his handle, the way he grabs a board and then takes off dribbling up the court, almost the way Al Horford does for Atlanta. I didn’t know Robinson was so skilled with the ball. Still want to see him down under the rim a little more to see how well he plays on the interior against bigger guys. 1. Props to the Kings for being the only team I’ve seen today to use their actual uniform number font on their summer league jerseys. 2. “KIDD-GILCHRIST” is on two lines on the back of his jersey, almost like how Isiah Thomas used to have his full name on two lines on his jersey. Hope he does that in the regular season, too. 10:17 PM EST — So we’re through with seven games and have one game to go — ONE TO GO — an epic battle between the Bobcats and the Kings. Under regular season circumstances, this might not be enough to keep me awake through the nightcap. But of course, this is summer league, so that means we get a heavy dose of rookies and young guys, so we’ll see high lottery guys like Thomas Robinson for Sacto and Michael Kidd-Gilchrist for Charlotte. Maybe these games that have been on all day haven’t all been incredible, but I get what we’re doing here. Teams are trying to find guys who fit into their specific systems, looking for certain talents or abilities that might make them more or less valuable, depending on what kind of team we’re talking about. Of course, this requires having a system and sticking to it. A team like San Antonio, for instance, has used the same system for a decade now, and they know what they’re looking for and precisely what their needs are. We just saw minutes ago that Barnes and Thomson are a nice fit for an uptempo offense. Perhaps we don’t exactly what style of play the Kings or Bobcats are going to use for the next decade, but we can at least see these rooks play and see what suits them or doesn’t suit them. And then we try and figure out if they’re gonna make it after all. • Well, what a blowout. I may or may not have closed my eyes for a few minutes there in the fourth quarter. (Hahaha, no just kidding, I totally didn’t fall asleep.) As poorly as the Lakers played through the first three quarters, they were even worse in the fourth. The Lakers probably could have played 10-on-5 in the fourth quarter and still not been able to come back. Final score is Golden State 91, Barnes and Thompson 47, Los Angeles Lakers 50. • I’ve seen this Common/USA Basketball commercial about 20 times today, and I’m still not certain what it is John Legend sings. “Theeeeeyy don’t talk about us”? • Wow. Klay Thompson rips Eyenga on the Lakers’ first possession of the half, then comes down and hits a pull-up three. Wow. • Next time down, Barnes rips a three from the other side. Double wow. • This was impressive: Eyenga dribbles his way inside and gets right to the rim, and Ezeli comes from the weak side and basically out-jumps Eyenga. • Jeremy Tyler checks in for G-State and somehow makes what’s nearly a 360 lay-up in traffic. • The Lakers seem to have a little more life but can’t get this thing down under 13 points. • I’ve been watching NBA TV since 8:00 AM and haven’t seen my main man David Aldridge on the air all day. I think that’s some sort of a record. Hope he’s getting some rest somewhere. • Barnes drains another three from the wing. He’s got 20 now, halfway through the third. • Klay Thompson and Barnes go 2-on-3 and Thompson ends up knocking down a transition three. He’s got 18, and the Warriors lead 57-33 with 2:25 to go in the third. • Out of a timeout, Thompson drains another three. His fellow Bahamian Rick Fox exclaims, “Cracked conch!” Barnes follows with another three. Pair these two with a healthy Steph Curry, and…wow. • As I was typing that, Thompson hit another three. Really. GSW leads 66-33. • And after three, the Warriors lead the Lakers 68-36. • Uh-oh. While I was trying to keep up with the GSW offense, I may have sprained my left index finger. I think for now my finger is listed as vowel-to-vowel. • I have to say, I got a little boost of energy there after eating that sushi. Think I’m gonna make it. Thanks for your concern. No, really. • Klay Thomspon drills a midrange jumper on the baseline. Such a great shooter. And interesting that that shot is so hard for NBA players to master. • Whenever the Lakers are able to pick up the tempo, they start to close the gap. But their halfcourt offense just looks miserable. • Darius Johnson-Odom might be listed at 6-2, but he has the shoulders of a 6-8 guy. • Enjoying watching Barnes, who plays really hard and stays moving, even when he doesn’t have the ball. He’s got 14 points with 5 minutes to go in the second quarter. GSW leads 35-18. • Rick Fox just mentioned that his first name is actually Ulrich. Like Lars? • Dunk of this game belongs to Christian Eyenga, who catches a Sacre miss and dunks it with two hands right over Draymond Green’s back. • The game finally opens up a bit at the end of the half, but GSW manages to hang onto their lead, and go into halftime with a 40-26 lead. Goudelock leads L.A. with 9 points, while Barnes has 14 and Klay Thompson has 10. • Joel Meyers, Steve Kerr and my main man Rick Fox are joining us on the NBA TV broadcast now. If you’re in Vegas, look for Rick at any of the fine vegan establishments in the area. • Harrison Barnes and Klay Thompson seem like they’d be a tough combo to deal with in the regular season, not less during a summer league game. • Pretty sure the NBA TV logo is going to be burned into the right corner of my TV by the end of this night. I’ll be keeping a receipt. • Lakers also have Darius Johnson-Odom, who’s worth watching, and I’m looking forward to seeing Draymond Green play for G-State. • Ezeli just blocked Robert Sacre on a face-up jumper. The feats of strength! • Andrew Goudelock, my favorite hobbit, finally scores to get LA on the board. Warriors up early, 9-2. • Good grief. Just checked out the box score for this game and realized the Warriors have 21 guys on their roster. And the Lakers have 17. Maybe they should play 10-on-10 during the second half to get more guys experience. • To be honest, I kinda miss the Suncatcher Awnings commercials. • Barnes looks good, making steals, getting after loose balls, finishing in transition and knocking down jumpers. 8:15 PM EST — Sushi, done, Raptors, done after losing to the Rockets, 93-81. The surprise of the day might just turn out to be Houston’s Donatas Motiejunas, who really showed the total package, going 11 of 13 from the floor while alternately attacking the rim and draining threes, defending shots on the inside and getting up and down the court. He finished with 25 points and 9 boards in 25 minutes of play, and he generally looked great. Now, of course, this is the first game of summer league, so there’s no telling what happens once the season gets going and Motiejunas starts running into guys bigger than he is and back-to-backs and all that stuff, but if he can replicate that motor regularly, he should be terrific. 7:38 PM EST — Motiejunas opened the second half with a Dream Shake into a baby hook that caused Chris Webber to say, “I came to Vegas and fell in love.” Motiejunas has looked great all game. Toward the end of the third quarter, Toronto went back to Bobby Brown, and he drilled a three and then sunk a tough layup. Don’t be cruel, Bobby Brown! My husband seems sluggish, should I be concerned? Are they playing in a high school gym? All the lines on the floor are confusing. There’s a guy who’s a really good passer, but I missed what his name was or who he is. He was wearing white. I miss the cheerleaders and dance squad — it’s not the same kind of game without them. No. 25 (Chandler Parsons) looks like a taller, thinner Kellen Lutz. Seems like a well-matched game. Houston on a run, 39-33. Wait, Toronto is coming back, 39-38. Royce White is really open about his anxiety disorder and fear of flying. I’d like to give him a hug. Should probably note that she’s not a basketball fan. Halftime now: Houston leads 41-40. 6:40 PM EST — Some interesting guys in this Toronto/Houston game: Royce White, Marcus Morris, Terrence Ross, Terrence Jones, Chandler Parsons and Donatas Motiejunas. My favorite might be Quincy Acy, who was a terrific dunker at Baylor. He also has an incredible beard. I think I’d enjoying seeing his beard fight against James Harden’s beard. Halfway through the first quarter, the Raptors lead 15-7. If they’re not careful, Daryl Morey’s going to trade them before halftime. But they bounce back and rip off an 11-0 run! Donatas Motiejunas, rocking a tight fauxhawk, looks pretty good, running the floor and managing to get a few easy buckets, then steps out to the corner and drains a long three. SHOEGATE, PART DEUX: Matt Winer points out Toronto’s Daniel Orton, who played with Orlando last season, is wearing blue shoes. So Orton and E’Twuan Moore both went with mismatched shoes, and both just happened to wear blue shoes? Strange that there are Orlando ties in both cases. Is this a coincidence or an epidemic? We need answers. After one quarter, the Rockets lead 22-20. It would’ve been a five-point game, but Toronto’s Bobby Brown drilled a three. It was his prerogative, y’all. 6:05 PM EST — So the Hawks built up a sizable lead in the second half, but the Wiz made a run and got it down to 15 with 8:30 to go. 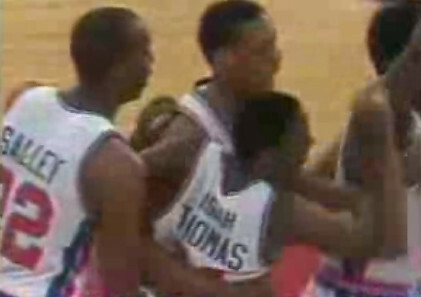 The Hawks then pushed back and managed to get it back to a 21-point game, and eventually won it 102-82. Nice all-around game from the Hawks, particularly from rookie John Jenkins, who scored from outside and inside, totaling 19, and looked like a guy who’ll be a nightmare to guard, the way he sprinted around picks and screens all over the court. Brad Beal also showed out, finishing with 22. First of all, as a Hawks fan, I have nothing but respect for Joe. He came to a terrible Hawks team in 2005, a team that won 13 games the year before. The Hawks desperately needed a franchise player, and Joe busted his tail trying to be that player. The Hawks were paying him a lot, and Mike Woodson got his money’s worth — his first three seasons in Atlanta, Joe never averaged less than 40 minutes per game. He did whatever he could to help the team, even playing point guard for a lot of his early tenure in Atlanta. Dude was capable of just taking over games. If the NBA was strictly a one-on-one league, Joe might’ve been first-team All-NBA. Because of his unique combination of size and strength and ball-handling, he could pretty much back down anyone, and if he couldn’t back you down, he could step back and get his jumper off. The problem with that, of course, is that the longer Joe had the ball in his hands, the less everyone else had the ball, and the more stagnant the offense became. As the Hawks improved over the years and filled in the lineup around Joe with capable players, it became more about balancing how to get the best out of Joe without having the rest of the team wither away. In the summer of 2010, the Hawks signed Joe Johnson to a huge contract extension, and the contract really became a referendum from fans on Hawks management. By bestowing the richest contract in franchise history upon Joe, they seemed to be at least attempting to quell any line of criticism that they didn’t want to spend money. The problem was, in doing so, the contract ate up a ton of cap space, so much so that fans believed they effectively hamstrung themselves from making any further moves, at least as long as Joe Johnson was on the team. Would fans have felt differently about Joe and that contract if he had been more demonstrative, been more of a talker? Maybe. But that just isn’t who Joe is, and for all his abilities on the court, he either just didn’t have the ability to be or the interest in becoming the demonstrative leader Hawks fans were looking for. But just because he’s a quiet dude, don’t think he doesn’t care about winning. I can’t remember how many times Joe’s first few seasons that I walked into the Hawks locker room after a loss and saw Joe sitting there alone in front of his locker, his back to the room, his head down. He might not always show it on the floor, but he does care. He never showed up out of shape, he played hurt numerous times, and was in general a true professional. He rarely talked about it (he rarely talked at all), but I always felt like his quiet professionalism was largely overlooked. At the end of the day, I’m a Hawks fan, and what I mostly care about is how trading Joe Johnson will affect the Hawks. And I think, long-term, this is a move the Hawks had to make. They needed to do something to make their attack more diverse and more dynamic. When there were rumors about Josh Smith being on the trade block, I hoped they weren’t true, mostly because Josh is such a unique player, he’s nearly impossible to replace. Also, when Joe was out injured last season was when Josh really blew up. Without Joe, the opportunity is there for Josh and Al Horford to step up and carry a larger load. I guess we’ll see what happens. 6:00 PM EST — This Hawks/Wiz game still has 1:48 to go even though the next game is supposed to be starting now. Refs seem a little whistle-happy — Jan Vesely just picked up his tenth personal foul. I’m not even joking about that. The Hawks got a couple of long jumpers from rookie John Jenkins, and led 20-15 after one quarter. After a commercial break, without any action taking place, the Hawks lead had swelled to 23-15 — I guess the Hawks brought their own scorekeepers to the game. Hawks’ second rounder Mike Scott also knocked down a couple of face-up jumpers, which is a nice skill if it’s something he’s able to do consistently this season. At the half, after closing out on a 22-6 run, the Hawks had a 50-34 lead. The Hawks had eight guys with at least 4 points in the first half. Bradley Beal broke out after a slow start to finish the first half with 14 points, including a nice breakaway dunk toward the end of the half. Another nominee for dunk of the day from Hawks big Paul Carter, who flushed on Chris Singleton. Not quite as great as Reggie Jackson’s earlier, but pretty nice. 4:45 PM EST — Turns out MarShon Brooks didn’t even know he was creeping up on Travis Diener’s record. 4:08 PM EST — Actually, turns out I was a few seconds behind on the DVR. Oh well. One weird thing: I brought up the box score on NBA.com and the score was listed as 5-2. On the screen, the score was 3-2. A few seconds later, Vesely drained a long jumper to make it 5-2. So I think maybe NBA.com can read the future. In related news, a man will come to my door in a few minutes and hand me a check for a billion dollars. 3:56 PM EST — Just took out the recycling, spoke to the UPS man, made a cup of coffee. It’s the little things. 3:38 PM EST — During the second half of this Brooklyn/Indy game, something hit me hard. It was an interesting enough game — uptempo, with a lot of scoring and back and forth action. But I’ve been sitting here on this couch since before 8:00 AM, and an unidentified wave of exhaustion washed over me. My shorts may or may not have woven themselves into the fabric of my sofa. Even Miles Plumlee’s acrobatic theatrics — Rick Kamla accurately compared watching Plumlee attacking the rim to seeing “a dolphin rising out of the water” — could not fully rouse me from this haze. As for this Nets/Pacers game, the Nets slowly built a 12-point lead by the end of the third, and Indy cut it to a 4-point game with 5 minutes to go, before Brooklyn pulled away. The real drama down the stretch was whether or not MarShon Brooks would break the Orlando Summer League scoring record. The record, of course, belonged to legendary Pacers guard Travis Diener with 34, and Brooks had 32 points with 2:32 to go. Brooks cleared everyone out and hit a J to tie the scoring record with about 2 minutes left. With about a minute to go, Brooks got the ball and the Pacers doubled him to make him give up the ball. He did, and the record of former Pacer Diener was temporarily protected! Next time down Brooks missed a runner in the lane. With 30 seconds left the Nets got a steal, and instead of pulling it out and trying to get Brooks another shot, Tornike Shengelia put his head down and went to the rim and got free throws. The Nets won 90-77, and the scoring record of 34 points in a game is now shared by Travis Diener and MarShon Brooks. Perhaps surprisingly, the most interesting match-up in the game was probably Plumlee against BK reserve center Tornike Shengelia, a Georgian import who is a tad undersized but plays with a ton of hustle and heart, and is a ton of fun to watch. So, we are officially past the halfway point. And if I needed a shot of adrenaline, it’s coming from my Atlanta Hawks, who play at 4:00 PM against the Washington Wizards, in a game also known as the Michael Lee Cup. See ya in a bit. 2:51 PM EST— If you were looking for highlights of the Sixers/Pistons game, look no further! 2:36 PM EST — Halftime in Orlando, and BK leads Indy, 45-35. MarShon Brooks is balling today, with 18 in the first half. Not sure if Brooklyn and Orlando will ever figure out a deal for Dwight Howard, but if today is any indication, it seems like Brooks can play well in O-Town. I have lived in New York City now for a dozen years, about one-third of my life. I grew up in Atlanta, a fan of the Atlanta Hawks, and while I’ll never be able to break that connection, I wondered when I moved here to NYC if I’d become a fan of either of the local teams, the Knicks or Nets. Over the years I’ve been to hundreds of games of the two teams, and watched even more games on TV, but I’ve never been able to make that heart-felt connection to either team. But now the Nets are moving to Brooklyn, and watching this process unfold up close, it feels like the reboot that they needed. I find myself curious how all this is going to work out. It seems unlikely that the Nets will immediately convert Knicks fans, but they’ve got a lot going for them: a cool new arena, a great logo, fresh shirts and hats, an owner with deep pockets, and one of the best backcourt combos in the NBA. The teams we root for are usually teams we’ve developed some long sordid history with through the years: We’ve grown with these teams and they’ve grown with us. But when a team decides to seek out a new history, it gives some fans looking for a place to hook on an option they’ve never had before. And then there’s Adam Morrison, balling for the Brooklyn Nets. For now. I can’t really sum up Morrison’s journey in a few words, but check out this terrific piece from NBA.com’s Fran Blinebury about Morrison. 2:02 PM EST — The Pacers have a point guard named Chris Kramer, who played at Purdue. If he makes the League, that’s a must-have jersey for “Seinfeld” fans. Best “Seinfeld”-related sports jersey since Jose Constanza from my Atlanta Braves. 1:57 PM EST — Welp: Went into the kitchen to grab lunch and returned 5 minutes before the game was scheduled to start to find the Pacers and Nets already underway, with the Pacers up 15-10. Summer League waits for no one! At this pace I might be done by 11:30 PM instead of midnight. 1:32 PM EST — Detroit forced a halfcourt violation at the start the third quarter, underlining what a defensive battle this game has been. Philly and Detroit combined for just 28 points in the third quarter, and for a while I was wondering if either team would break 50. It was a physical game — Solo Jones actually gave his teammate Xavier Silas what was reported as a concussion after catching him with an elbow while blocking a shot in the third quarter — and the least uptempo game of the day. Detroit took a 61-59 lead with 3 minutes to go. Daye then sunk a tough fadeaway along the baseline to make it a 4-point game, and then Casper Ware hit a runner in the lane to make it a 6-point game. Justin Holiday (Jrue’s brother) hit a three for Philly to cut it to 3. It was a two-point game with 5.6 seconds left when Casper Ware nearly turned it over, got the ball back and hit a floater to clinch it. Detroit wins 71-67. Kim English finished with 17 for Detroit (4-7 on threes), and Austin Daye posted a double-double (10 and 11). Devin Searcy had a double-double for Philly, with 10 points and 12 boards. So with that, we are three games down, five to go. I just realized I don’t really know anything else that has happened in the world today — I am hopeful that The Powers That Be at NBA TV will put it in the crawl if I win the Powerball or something. 1:14 PM EST — To me, guys like Solomon Jones, playing for Philly today, are the kind of players who make following the NBA interesting. Jones was a second-round pick by the Atlanta Hawks back in 2006 out of South Florida. He was tall (610), with an impressive #wingspan. He was known mostly for blocking shots, and the Hawks needed size, so he got a shot and played almost 60 games as a rookie. Since then he’s bounced around, playing for Indiana, New Orleans and Clippers. He contests shots, grabs rebounds. He’s not going to score 40 points, not going to grab 20 boards, but he’s a competent role player coming off the bench that allows you to rest your starting five for a few minutes without giving up too much. Jones has now played six seasons in the NBA, but he’s still here playing in the summer league, trying to prove himself to NBA teams. Or perhaps he’s just trying to prove something to himself. Either way, these are the kind of players who make the NBA work. And watching them put in work around the margins is another facet of what makes the NBA fun. For me, anyway. 12:35 PM EST — Halftime in Orlando at game three of the day. I mentioned earlier that I don’t get to watch a lot of college ball, but watching Philly and Detroit play I can see why NBA teams were so intrigued by Andre Drummond coming out of UConn. Dude is huge, a nice combination of size and strength and quickness, with what looks like nice touch around the rim. Austin Daye has also looked good on the interior for Detroit (8 points and 9 boards in the first half), and the Greg Monroe/Daye/Drummond combo looks like a really promising foundation for Motown. It’s actually been a pretty good defensive half from both teams — Detroit forced the first five-second violation of the day on an inbounds pass in the second quarter. Devin Searcy and Jon Scheyer were the most active players for Philly, and the Sixers have scored most of their points on rebounds and second-chance buckets. Philly leads 38-33 at the half. Just realized I haven’t actually seen the shot clock come into play all day, which made me wonder if they were actually using shot clocks. As it turns out, yes, these teams are using shot clocks. At least the shot clocks aren’t using them. 11:56 AM EST — Two games down, six to go! Philly and Detroit are now underway. NBA TV has swapped announcing crews, going from Vince Cellini and Kendall Gill to my main men Rick Kamla and Dennis Scott. Meanwhile, I get to no relief. I did just get up and walk around a little bit, just to get the blood flowing. No Brandon Knight today for Detroit, but Austin Daye and Andre Drummond are both playing. Meanwhile, former Hawk Solo Jones is off to a fast start for Philly. 11:41 AM EST — One good thing about watching these summer league games all day is that next season, when pretty much anyone gets called up to the NBA, I’ll be able to say, “Oh yeah, I saw him playing summer league.” Because after today, I’ll have seen something like 100 dudes play. Nearly every guy who is clinging to the fringes of the NBA, hoping to make it next season, is playing right now, trying to prove their worth to some team out there. For the Celtics, E’Twuan Moore got hot in the third, and Boston took total control, defensively and offensively, opening the second half with a 14-2 run and finishing the third quarter sitting on a 71-49 lead. (Highlight of the third quarter for Orlando might have been when Charlie Westbrook broke Jamar Smith’s ankles.) The C’s got the win, 94-73. Justin Harper finished with 16 for Orlando, and after a 19 point first half, Dionte Christmas finished with 21 for Boston. Dionte Christmas has been quite a present for the Celtics. Dionte Christmas really has a gift. Dionte Christmas is the gift that keep on giving. If the Celtiics end up not keeping Dionte Christmas, does that make Danny Ainge the Grinch? Dionte Christmas could play alongside Hollis Thompson and form a “Christmas and Hollis” backcourt. 11:32 AM EST — As this Magic/Celts game winds down, check out this post from my main man Micah Hart about the Kyrie/Kobe trash talk. Fun stuff. 10:56 AM EST — Dionte Christmas should totally wear red shoes with his green Celtics uniform. 10:45 AM EST — After a lively OKC/Utah game, this Boston/Orlando game started slow before picking up pace. The Magic led 20-19 after 1, and after a sluggish start to the second quarter, things picked up a bit, and Boston took a 43-33 lead into the half. ORL’s Justin Harper and Boston’s Dionte Christmas each had 8 in the first quarter, and Christmas played with energy the entire first half, stealing inbounds passes, pushing tempo, getting to the line, even completing a four-point play just before the half. Christmas finished the first half with 19 points and 3 steals. Summer League mainstay Magnum Rolle is playing for Orlando this summer. He’s listed at 6-11, 235, but he looks like Goliath out there against some of Boston’s post guys. NBA TV’s Kendall Gill rightly called out Boston’s E’Twaun Moore for wearing black/blue Nikes with his Celtics green uniform: “That’s a fashion faux pas.” As soon as Gill mentions this, Moore drains a long three then knocks down a runner. Moore’s shoes look suspiciously like a pair of Orlando shoes, making me wonder if Moore perhaps had a blowout with his regular shoes and had to borrow a pair from someone on Orlando. If I was the sideline reporter for this broadcast, I’d spend the next fifteen minutes doggedly tracking down this story, trying to get to the bottom of this conundrum. This is probably why I’ve never been asked to be a sideline reporter. By the way, don’t forget that right now the Orlando Magic don’t actually have a head coach. Their Summer League team is being coached by Mark Price, and he’s being assisted by Bo Outlaw (at least I think that’s Bo Outlaw — not used to seeing him without goggles). Every time they show the bench, Outlaw looks to be assiduously taking notes. I might ask him to take over the live blog for the next game. Dunk of the game thus far is from Orlando’s Dequan Jones with a right-handed tomahawk on a fast break. Gonna be hard to top Reggie Jackson’s dunk on Jeremy Evans from earlier, however. 10:32 AM EST –I’m not blogging slow, I’m pacing myself. 10:08 AM EST — Game two brings us Orlando against Boston. No Jared Sullinger today for Boston — the Celts are apparently giving him the day off, which is understandable, considering he’s battled back problems and has made it through healthy thus far, averaging 13 and 8. No reason to get injured in the final game. Boston’s other first rounder, Fab Melo, is out there playing. I don’t watch much college ball, mostly because it takes place during the NBA season, but Melo and Sullinger are two of the more high-profile guys. Meanwhile, early on, Dionte Christmas is lighting it up for Boston. Kyle O’Quinn from Norfolk State is playing for Orlando, as is their first round pick Andrew Nicholson. Gonna have to study to come up with some of the other Magic player names. 9:52 AM EST — As for the game itself, the Jazz led most of the morning (that feels weird to type), but the Thunder went with a smaller lineup and began the fourth quarter on a 19-4 run. The Thunder took the lead behind a couple of buckets from Garrett Temple and Latavious Williams. They controlled the post, grabbed every rebound and loose ball that was available, and when they didn’t have an open shot, they got to the line again and again: The Thunder started this game 26-of-26 from the line, a streak that ended when guard John Holland went down with a knee injury, then composed himself and went to the line and knocked in one of the two. Enes Kanter ended up having a big fourth quarter for Utah, grabbing a couple of offensive boards and keeping Utah in the game. I mentioned earlier wanting to see him and Aldrich develop, and though Aldrich sat when OKC went small, Kanter finished with 15 points and 8 boards, leading Utah in both categories. Lazar Hayward led OKC with 15 points, but Latavious Williams finished with a rugged 11 and 10. Dunk of the day came with 5:14 to go in the third, when Reggie Jackson drove the lane and just tomahawked on Jeremy Evans, who got stuck between trying to block it or trying to take a charge. Vicious slam. I’ve enjoyed watching OKC’s Latavious Williams, whom hoops junkies may recall as the guy a few years ago who drafted straight out of high school and into the D-League. Now he’s 6-8 and a sculpted 230+, and looks like a smaller Kendrick Perkins. Williams plays in Spain and manages to get inside and eat space and be around the ball. And he’s still just 23 years old. Putting a body on Jeremy Evans seems to be the only way to slow him down. Dude is flying up and down the floor and manages to launch himself at the rim over and over. He’s relentless, at least in his leaping. Nickname suggestion: “Major” Lazar Hayward. Look of the day thus far goes to Deron “Smash” Washington on Utah. As Kendall Gill notes, “He not only has an afro on his head, he has an afro on his chin.” He kinda resembles one of the guys from LMFAO. Strong look, especially for summer league. Early nominee for name of the day goes to OKC’s Dwight Buycks, who played at Marquette but, more importantly, his name somehow rhymes. 8:18 AM EST — OK, I’m up with my coffee and cereal, watching Orlando/Utah. It’s 8 AM in Orlando, and Kendall Gill, who is announcing the game on NBA TV along with my main man Vince Cellini, just noted you’re not supposed to be able to tip dunk this early in the morning. I believe he was referring to Jeremy Evans, the reigning dunk champ, who is playing for Utah and whose hops apparently need no wake up call. I was in Vegas last summer watching guys work out at Impact Basketball, and saw Evans dunking all over the place and blocking shots. So I wasn’t surprised when he won the dunk contest, though I was a bit surprised when he didn’t do much else during the season. He’s got 6 points, a rebound and a block in the first five minutes here in Orlando. He’s so aggressive in this game, but for some reason that hasn’t translated to regular season NBA action yet. By the way, Utah’s got Michael Stockton out there now, son of John, and he’s playing well, particularly on the defensive end where he’s D-ing up OKC’s Reggie Jackson. I just wish the Jazz could have signed any guy named Malone to team him up with. 7:45 AM EST — My wife likes to tell people that I skip to work. She means this in a metaphorical sense — not that I actually skip to work, like A.J. on WWE cards — but that I honestly and truly love my job. She’s right about that. I write about sports — mainly basketball — for a living, and I really do love my job. I get to travel the world and watch hoops and talk to people who know a lot about basketball, all day every day. Yeah, there are times when it’s a grind, like when you’re on that red-eye from the West Coast for the second time in a week. But for the most part, it is fantastic. I love basketball, and I love to watch hoops whenever I get the chance. Before I get ahead of myself, I guess I should probably explain who the heck I am. Get familiar: I write for SLAM and several other places, and I talk on NBA TV and on The Hang Time Podcast here on NBA.com, the weekly show where I mostly endure NBA.com’s Sekou Smith. So it would appear that I am uniquely qualified for the task that lies ahead of me, a daunting and challenging job which which I have been entrusted: I have been asked by The Powers That Be to spend the day rooted to my couch here in New York City watching basketball on NBA TV and writing about said basketball here on NBA.com. (I think the kids call this a “live blog.” Or maybe it’s “bive log.” Something like that.) There are eight(!) summer league games airing live today from Orlando and Las Vegas on NBA TV, a full slate of action that I have been assured by The Powers That Be will be a “high-water mark.” I think that means we’re in for some good stuff. It wasn’t until I actually typed out that list that I started to realize what I’ve gotten myself into. Yeah, yeah, tough work, I know. Anyway, I’ll be here all day looking for awesome dunks, Google-ing guys I’ve never heard of, trying to get a glimpse of rookies we expect to see a lot of this season and occasionally running laps around my coffee table to stretch my legs before an embolism develops. Before we get this going, I promise you this: I will give y’all my all. I’ll be updating frequently throughout the day. I’d love it if you guys wanna hang here all day, or for a part of the day, or whatever. Drop a comment down below, send me a tweet, ask questions in the comments, whatever you want. I ain’t going anywhere. Thanks DeMarco. Ready for the Hawks at 4?